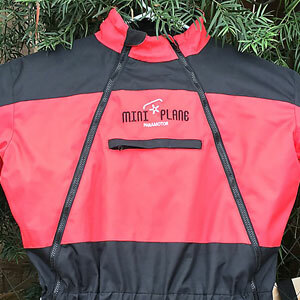 Show your affection for Powered Paragliding and your favorite paramotor with this Miniplane Paramotor Flight Suit. This Winter Flight Suit is a high performance one-piece flight suit designed to shield you from the elements while aviating. Freezing high altitude temperatures and Reflex Glider induced windchill will no longer get you down, and you will cruise around in the sky in comfort and style. A multi-layerd waterproof / windproof shell with thick liner, full leg and chest zips, zip pockets, and a high collar to keep your neck warm, this Winter Flight Suit is a high-tech flight suit at a reasonable price for pilots of all abilities. 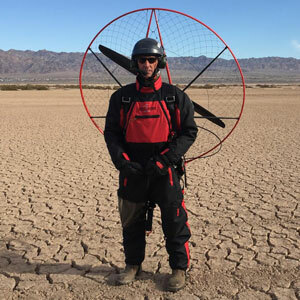 The color of this suit is Black with Red accents with the Miniplane Paramotor logo embroidered on the front, and is available in sizes Medium and Large. For paragliding and paramotoring, we recommend getting the next size up so you can wear the suit over your clothes and still have enough room to raise your arms easily. Great for those cold early morning flights! 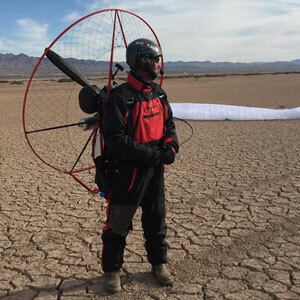 Miniplane Paramotor Takeoff featuring the Logo Embroidered Winter Flight Suit.